We are thrilled that industry experts and customers have recognized our ability to align technology with the most important needs driving today’s market. The accolades awarded to SumTotal and Skillsoft in the past few months illustrate our continued dedication to innovate and deliver products and services that help customers achieve their business goals with HR technology. Brandon Hall Group 2014 Excellence Awards: SumTotal and Praxair won Gold in the “Best in Talent Management Technology Implementations” category for Praxair’s use of SumTotal Talent Expansion applications, and SumTotal and McAfee took Silver for “Best Use of Learning and Talent Technologies” for McAfee’s use of SumTotal’s learning and analytics in its sales kickoff training. Skillsoft was honored as well, with a Gold award for the “Best Use of Blended Learning” in its work for customer Lawrence Livermore National Laboratory. Elearning! Magazine “Best of Elearning!” Awards: Customers honored Skillsoft and SumTotal in multiple categories in Elearning! Magazine’s “Best of Elearning!” awards, which are voted on by users. SumTotal was given an Award of Excellence for Best Learning Management System (LMS) for both SumTotal Maestro (cloud) and SumTotal Learn (enterprise). Skillsoft was the Category Winner in Leadership Content (Skillsoft Leadership Advantage) and given an Award of Excellence in IT Training (Skillsoft IT Certification), Soft Skills Content (Skillsoft Business Skills Catalog) and Outsourced Learning Services (Skillsoft Professional Services). Hot Vendor in Ventana’s 2014 Value Index for Total Compensation Management: Ventana Research named SumTotal a “Hot Vendor” in its 2014 Total Compensation Management Value Index. The report is a detailed evaluation of technology vendors that support total management of employee pay, an organization’s largest controllable expense. Chief Learning Officer Magazine’s Learning in Practice Awards: Skillsoft earned an Excellence in Content Award (Silver) in Chief Learning Officer’s Learning in Practice Awards for the quality of its content featured in the Welch Way Management Development Program. Training Industry Top 20 Lists: Skillsoft was recognized in Training Industry’s 2014 Top 20 Workforce Development Companies, Top 20 Learning Portal Companies and Top 20 IT Training Companies lists. CIO Review’s 20 Most Promising Education Tech Solution Providers: Skillsoft was included in CIO Review’s list of the “20 Most Promising Education Tech Solution Providers,” which featured the best solution and service providers offering technologies and services related to education. Military Training Technology Top Simulation & Training Companies: Skillsoft’s inclusion in the list of Top Simulation & Training Companies reinforces our commitment to providing technology that allows U.S. airmen, Marines, sailors, soldiers and Coast Guardsmen to train and rehearse for missions or prepare for deployment. Business NH Magazine’s Top 100 Private Companies Survey: Business NH Magazine named Skillsoft in its annual list of 100 New Hampshire businesses making significant contributions to the New Hampshire economy. Oscar producers went with a more traditional approach for the show last night. And while it lacked some of the entertainingly awkward moments from last year, with the exception of Jennifer Lawrence stumbling for the second time, I found it hard not to get caught up in all of the excitement as I kicked back on my couch to watch it. When Lupita Nyong’o gave her heartfelt acceptance speech for Best Supporting Actress and later Bette Midler sang “Wind Beneath My Wings,” I admit it, I got a little choked up. But, I also smiled as the married songwriters and Best Original Song winners rhymed their way through their thank yous, and laughed at Ellen’s epic selfie, which apparently crashed Twitter. Most of us will never experience the pageantry of the Oscars, but beneath all of the glitz and glamour, the Academy Awards really boil down to one thing – peer recognition for a job well done. And that’s something that we all can and should go after for our customers, our organizations and ourselves. Here at SumTotal, we’ve placed a bigger emphasis on that recently, and it’s paid off. Their creative approaches to Talent Expansion™ deserved recognition, and we were thrilled to give them a platform to showcase their initiatives. They earned acknowledgement for their innovation and other attendees walked away with new ideas. Win, win! Speaking of which, we’re accepting nominations for the 2014 SumTotal Customer Innovation Awards through August 18. That third-party validation, of course, helps the organization in terms of sales and marketing opportunities. But this industry recognition also boosts morale. Putting together a winning application is important for personal reasons too. 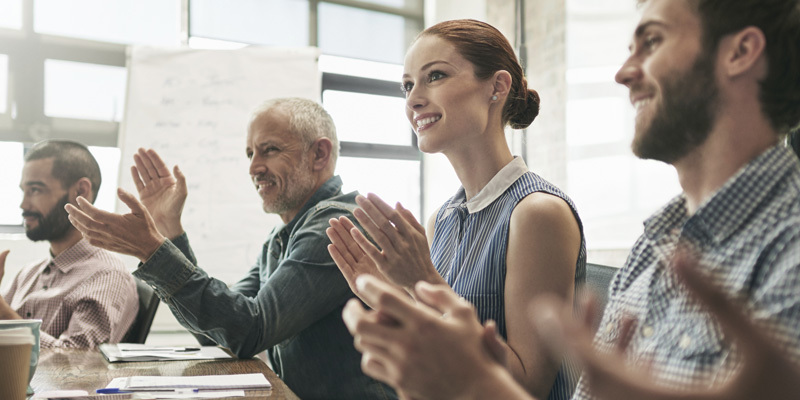 Not only does it feel great, (“I was jumping up and down in my cubicle when I heard our name,” is what one customer emailed after learning they’d won), it’s also an opportunity to get internal recognition for your team’s efforts and is another way to strengthen your personal brand. There are dozens of awards programs out there, from industry publications to analyst programs. I encourage you to research them to find ones that fit with what you and your organization are trying to achieve. Make note of deadlines and application requirements. Mark your calendar with reminders. Then, throughout the year, file away examples of successes to make it easier to build your application. Having solid metrics matters, so be prepared to demonstrate measurable results of your programs.